Thanksgiving is tomorrow, and Christmas/Hannukah/Kwanzaa/whatever winter holiday you like to celebrate is almost here! I'm so excited to begin all our fun holiday traditions, like driving around and looking at all the beautifully-lit houses, baking cookies, wrapping presents and hanging stockings. The delightful aroma of the kitchen during the holidays – with smells of cinnamon, peppermint, chocolate and vanilla – is a scent that many associate with long lived memories. The holiday season is a perfect time to create flavorful memories with your family and loved ones. 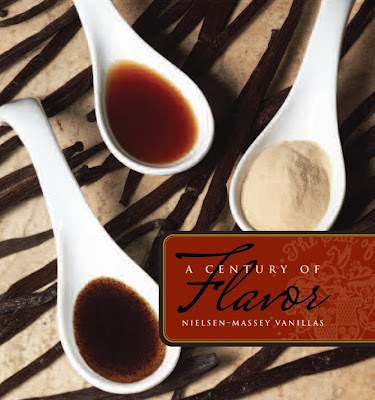 Nielsen-Massey Vanillas A Century of Flavor cookbook provides moms with a variety of holiday recipes. Vanilla Carmel Corn Crunch can be made with your young chef, while Creamy Vanilla Sweet Potatoes is a perfect side to your family’s main course. This vanilla-inspired cookbook, published by family-owned Nielsen-Massey Vanillas, celebrates the exciting nuances of one of America ’s most-loved and versatile ingredients – pure vanilla. It is filled with 50 of the most tantalizing recipes, highlighting the intricate, yet delicate flavors of pure vanilla and is written for the novice cook as well as the seasoned chef. This ain't no plain vanilla cookbook! Gorgeous photos and an informative introductory section on vanilla make it almost like a coffee table book that you can leave out for guests to look at and enjoy while they're waiting for dinner to be served. The recipes are as fine and elegant as the Nielsen-Massey vanilla itself. Each recipe contains vanilla, in some dishes that I would never have thought of. Vanilla in eggplant parmigiana? In osso bucco? Sounds weird, but I tried making the eggplant, and it was delicious! I also love the section where noted chefs like Rick Bayless contribute their own recipes with vanilla in them. The recipes in this book are not for lazy cooks. And substituting other vanilla brands is not easy in some of the recipes that call for very specialized Nielsen-Massey ingredients, such as a vanilla bean pod or vanilla bean paste. Now that's something you can't grab at your local convenience store! This cookbook has great some great ideas for holiday meals, and the vanilla in all of them makes them extra special. So crank up the holiday tunes, get cooking with your loved ones to create your next delectable holiday meal. One lucky Bonggamom Finds reader will win a copy of A Century of Flavor. To enter this giveaway, simply leave a comment here and tell me your favorite vanilla dish. Don't forget to leave an email address or some other way of contacting you. 1) Grab my button -- it's on the left hand sidebar, or click here to get it -- and post it on your blog! (leave a comment here with a link to your site). 2) Blog about this giveaway and include a link to the giveaway post (leave a comment here with a link to your post). Maximum of 4 entries per person. US mailing addresses only. This giveaway ends at midnight PST on December 12, 2009.; I will draw a winner at random on December 13 and post the winner's name on the comments section after the winner confirms acceptance . For additional giveaway rules, click here. Good luck! I received a complimentary copy in order to review this book, but no monetary compensation. The views and opinions expressed here are my own. I make a zucchini bread which is really pretty good. It calls for 5 tablespoons of vanilla. It is simply delicious. Thinking of the holidays, I love Snowball cookies. I really love vanilla cream pie with whipped cream on top. Very yummy! Thank you! I make rum balls at Christmas that call for lots of vanilla. Delicious! I like to make a vanilla cream cookie for the holidays.. It is so so good. Creme Brulee is my favorite vanilla dish! Vanilla malted milkshakes are the best. Creme Brulee. YUM. Thanks for the giveaway. I'd have to vote for a caramel vanilla flan as my favorite vanilla dish. yum. caramel vanilla flan - yum! Suet pudding with hard sauce. Thanks for the contest! I am a fan of the classic vanilla pudding! Homemade vanilla ice cream from our ice cream maker! I love homemade vanilla ice cream. Vanilla Bean Cheesecake with Walnut Crust - delicious! Try hot milk with a tip of vanilla and grated nutmeg. I LOVE Vanilla in my coffee and I also love it in my sweet potatoes and my peanut butter cookies and...this could go one forever. Vanilla Bean cake is my fave! Vanilla ice cream would be my favorite! Hmm. To be honest, I haven't had many vanilla dishes.. I love vanilla ice cream though, and vanilla in my coffee as someone before mentioned. I'd love to try a caramel vanilla flan. This giveaway is now closed. Thanks to everyone who entered, and congratulations to the winner: #35, aMELANIE!